There are five primary sources of real fuel loss, and without the right measures in place to identify and prevent them, your business could be losing money without even knowing it. For starters, what are the five biggest sources of real, physical fuel loss? Do you know--without a doubt--if all the fuel in the delivery truck made its way into your storage tank? What is your process for confirming bill-of-lading accuracy? Deploying the right technology to protect your fuel assets and ensure you’re getting what you pay for is crucial for reducing fuel loss from delivery discrepancy. You rely on your fuel meters to accurately measure and charge for the amount dispensed, but normal wear and tear prevents these meters from performing accurately between calibrations. With the growing number of contaminants from today’s cleaner fuels, recalibration and maintenance are needed more frequently, compromising the accuracy of your meters and likely giving customers more fuel than they have paid for. From credit card fraud to 600 gallons of fuel missing from delivery trucks – theft eats away at your profits. Thieves can be creative and often find ways to siphon fuel straight from underground storage tanks, bypass dispenser meters, and drive off the forecourt before paying. For every gallon on fuel lost, you must sell 17.5 more gallons of fuel just to recoup the profit. Fuel expands or contracts depending on temperature. This can occur both in the delivery truck and the underground storage tank. If it is cold outside, the fuel could contract in the truck before delivery occurs, causing a variance between the actual delivery and the bill of lading. Alternatively, if the outside temperature is warmer than the temperature below ground, a fuel delivery may contract inside your tank, resulting in the appearance of loss without any delivery discrepancy. Storage tank leaks are likely the most straightforward source of fuel loss, but also the most urgent. 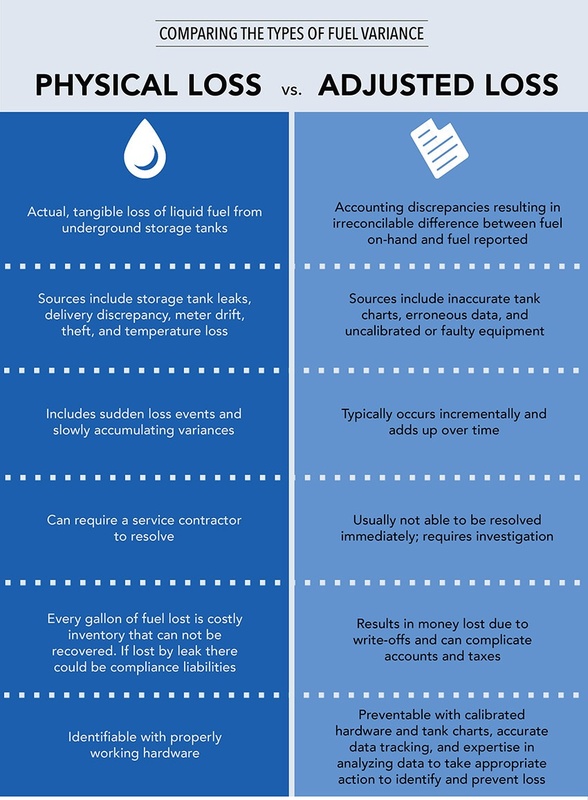 Aside from the hazardous environmental and regulatory repercussions of a storage tank leak, profits also take a hit when a leak is present. Fortunately, there are a variety of solutions available to detect and prevent storage tank leaks, from automatic tank gauges to alarm management services. These types of physical loss present a tangible problem that you can see, both at your site and in your bottom line. Adjusted, or “measurement” loss, on the other hand, can be much trickier to pinpoint and resolve. To better understand the differences between these two types of fuel variance, read through the table below. Insite360's Advanced Variance Analysis (AVA) service monitors fuel sites to continuously reconcile inventory and deliveries, identify instances and sources of fuel variance, and provide actionable recommendations to reduce loss. Our solution provides advanced detection and analytics to pinpoint variance and physical loss that could be masked by data, reporting, and equipment errors. AVA solutions reduce shrinkage and cost while maximizing fuel revenue.